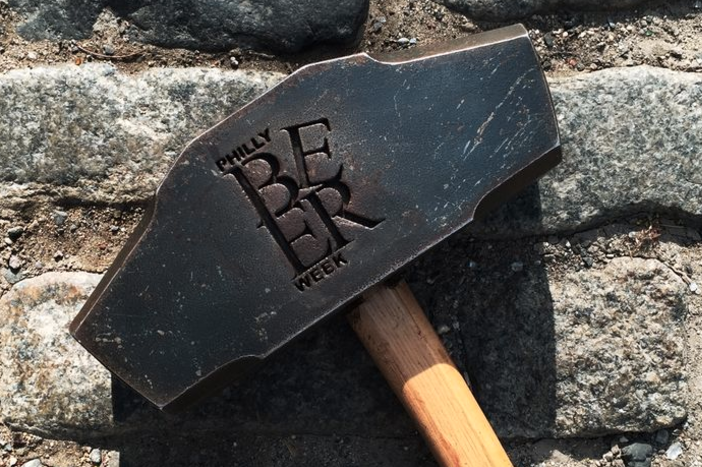 The Hammer of Glory – the symbol, both literal and figurative, of Philly Beer Week. On Thursday, June 1, Philly Beer Week's signiture kick-off party Opening Tap will take place at The Fillmore. 2017 marks Philly Beer Week's 10th year. The 10-day beer festival will run from Friday, June 2 through Sunday, June 11. The week features plenty of exciting events, but for many Opening Tap the night before is a can't-miss. Ticket holders receive unlimited samples from more than 40 breweries and cideries, including first tastes of the official 2017 Philly Beer Week beer. Gravity Never Fails is a collaboration porter brewed with experimental hops created by 2SP Brewing in Aston, Delaware County, and Brouwerij De Ranke in Belgium. There will also be live music on stage and food from Wolfgang Puck on sale. The event suggests "take Friday off," to fully enjoy the party. General admission tickets are $45 per person, while VIP tickets are $95 per person. Perks of being a VIP include balcony views in The Fillmore, private bathrooms, exclusive pours, early access to the event and catered food. Leading up to Opening Tap, Philly Beer Week's official mascot – The Hammer of Glory – will be passed Olympic torch-style from venue to venue in Philly before arriving at The Fillmore to ceremoniously tap a keg of Brotherly Suds, a collaboration beer from local breweries Troegs, Victory, Yards, Sly Fox, Stoudt’s, Iron Hill and Flying Fish. The Hammer of Glory's 2017 route to Opening Tap is below, although there is a chance the schedule may change. •Hop Angel Brauhaus, 7980 Oxford Avenue, 9:00 a.m.
•SawTown Tavern, 4717 Princeton Avenue, 9:33 a.m.
•Grey Lodge Pub, 6235 Frankford Avenue, 9:56 a.m.
•Bonk’s Bar, 3467 Richmond Street, 10:24 a.m.
•Philly Brewing Company, 2439 Amber Street, 11:02 a.m.
•Evil Genius, 1727 North Front Street, 11:31 a.m.
•Saint Benjamin, 1710 North 5th Street, 12:00 p.m.
•London Grill, 2301 Fairmount Avenue, 12:33 p.m.
•The Belgian Café, 601 North 21st Street, 12:52 p.m.
•Billy Penn, 1429 Walnut Street, 1:30 p.m.
•Jose Pistola’s, 263 South 15th Street, 1:46 p.m.
•Garage Passyunk, 1231 East Passyunk Avenue, 2:07 p.m.
•Varga Bar, 941 Spruce Street, 2:35 p.m.
•Fergie’s Pub, 1214 Sansom Street, 3:03 p.m.
•Opa & Drury Beer Garden, 1311 Sansom Street, 3:25 p.m.
•Tiki, 102 South 13th Street, 3:39 p.m.
•TIME, 1315 Sansom Street, 3:53 p.m.
•Craftsman Row Saloon, 112 South 8th Street, 4:16 p.m.
•El Camino Real, 1030 North 2nd Street, 4:59 p.m.
•Heritage, 914 North 2nd Street, 5:13 p.m.
•Standard Tap, 901 North 2nd Street, 5:27 p.m.
•Yards Brewing, 901 North Delaware Avenue, 5:50 p.m.
•Frankford Hall, 1210 Frankford Avenue, 6:13 p.m.
•Johnny Brenda’s, 1201 Frankford Avenue, 6:27 p.m.
•Garage Fishtown, 100 East Girard Avenue, 6:41 p.m.
•The Fillmore, 29 East Allen Street, 6:59 p.m. This year’s Hammer of Glory relay will be sponsored by SugarHouse Casino. To grab a seat on the double-decker bus that makes its way to each venue, purchase a $10 ticket.